I love to have friends over for dinner. I get to plan a fun meal, wear an apron, and sing along to Gene Kelly on pandora while I put everything together. 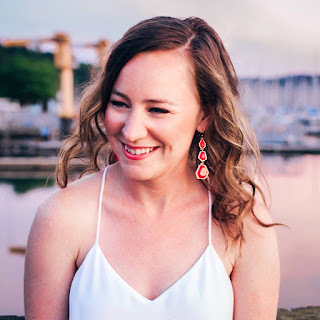 A couple months ago I hosted a fun "house happy hour" and had a few girlfriends over at 4pm on a Friday to have some drinks and apps. It was the tail end of summer and I had a bunch of peaches that I had canned so I decided to whip up a double batch of Sangria! 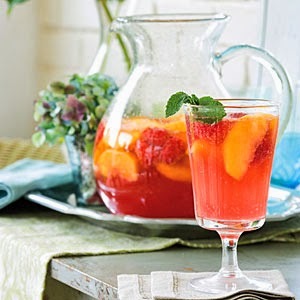 This delicious peach sangria calls for fresh peach slices, fresh raspberries, and peach nectar for its fantastic flavor. Be sure to use rosé wine, not a white. It was definitely a hit, looked gorgeous in the pitcher, and was so easy to make. This is definitely a drink recipe I will make again!